The presence of statistics is the essential element of the decision for the Query Optimizer ( as long as we are not talking about Columnstore Indexes, which is a very different Story). 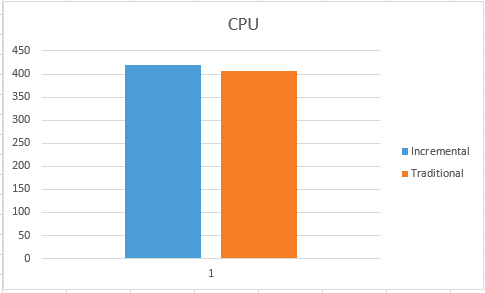 In the upcoming SQL Server 2014 (I am writing this article at the time when we still have CTP2), Microsoft will be giving us a new feature – Incremental Statistics. This feature will allow us to create and update statistics on the partition level with much better frequency. Traditionally we could have an automated statistics update when we reach a 20% threshold of the table in question, which is still a pain in the neck for some cases, such as Filtered Statistics, for example. In Service Pack 1 for SQL Server 2008 R2, Microsoft has introduced a trace flag 2371 which enabled a different threshold for automated statistics update for the tables with large number of rows. For a good number of cases this trace flag was a very nice improvement, but that was never enough. For very big tables with billions of rows there is still a need to update statistic regularly especially in the cases when we are loading new data into our table. Should loaded data be under the current threshold, then we won’t get any statistics update and it would mean that the queries running on that partition would be using potentially wrong statistics. And should we hit the threshold, then for updating the statistics, we need to sample whole table, which might take long time. Very long time. 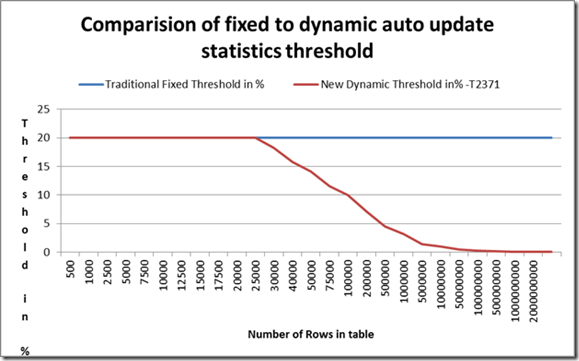 Enter Incremental Statistics in SQL Server 2014! The target of the incremental statistics in SQL Server 2014 is to enable a very fast update of very large partitioned tables, as well as enabling auto-update with higher frequency. The implementation idea is to have one statistics object for each partition, with binary merge of per-partition statistics to form the global statistics when necessary, while persisting on the disk the complete tree of statistics objects. Any update for a partition will mean just merging the newly created object with the rest of the statistics tree. This feature is definitely targeting partitioned tables, since it will allow a very fast update of a part of a table. Notice, that for database operation the (INCREMENTAL = ON) is being used, while for incremental statistics creation with INCREMENTAL=ON is being used. I hope Microsoft will get to correct this to be identical before the final release. 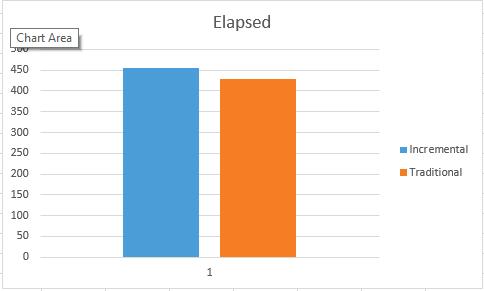 My results were varying between 390 ms & 422 ms for CPU time and between 404 ms & 450 ms for the elapsed time. This time the execution times varied from 407ms to 422ms for CPU time, and between 437 ms and 489 ms for the elapsed time, which is slightly slower then the creation of the non-incremental statistics. Given results has shown that my PtdFactOnlineSalesIncremental statistics were the only one created as Incremental. Here are the images of the average times, they show clearly that Incremental statistics are to take a little bit more time than the traditional ones. This is an expected result, since we are creating more objects internally. I know that these tests are quite basic, but all other tests I have done so far – have given quite a similar picture. The former is a DDL command like “ALTER Index” is, whereas the latter command is a Database SET option.